Reading through the publications by both Japan’s Ministry of Foreign Affairs Department or Shimane Prefecture’s Takeshima homepage they would have us believe the Dokdo – Takeshima problem originated after World War Two when South Korea declared the Rhee Line. However, going further back in history to the era when Japan began to colonize Korea it’s clear the Dokdo dispute started long before the early 1950s. In reality, the first documented evidence over this dispute came only days after Chosun officials were notified Japan had annexed Dokdo. 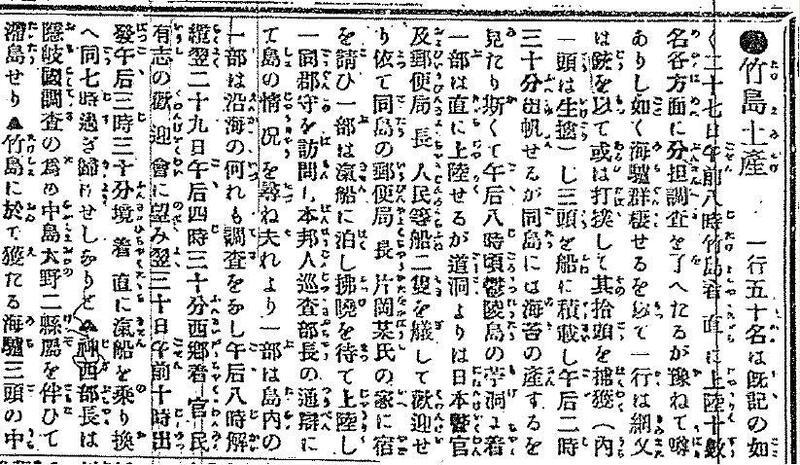 This article details how the Korean government and media responded to Japan’s first illegal land “acquisition” of Korean territory. The following section is a Japanese news article describing the circumstances in which Japan notified Korea that Japan had annexed Dokdo Island over year after the fact. It also gives us a small insight as to the situation on Ulleungdo Island in 1906. Below are the images of the news article followed by a translation provided by a pro-Japanese Takeshima website. Below is an English translation of the Japanese newpaper article. To the right below is a picture of the Japanese party who visited Ulleungdo Island. 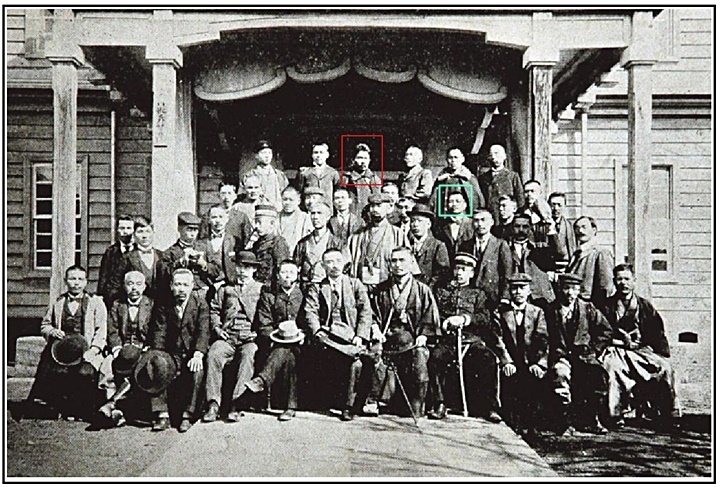 Among the group was Nakai Yozaburo, the Japanese civilian whose application to have Dokdo annexed was forced through by the expansionist Meiji Government and Imperial Navy’s Hydrographic Department. “…The party of fifty people arrived at Takeshima at 8 a.m. on the 27th, as we have already reported. They soon landed and dozens of people from various fields of study began their investigative work. As previously rumored, there were pods of sea lions living on the island, so the party caught ten of them, including a live one. Some were caught with a net or guns, and some were clubbed. They loaded three of them on the ship and departed at 2:30 p.m. They saw laver growing at the island. They arrived at Ulleungdo’s Jeodong (芋洞) at about 8 p.m. Some disembarked right away when Japanese policemen, the postmaster, and other people from Dodong (道洞) came on two boats to welcome the party. It was arranged that some of the party would stay at Postmaster Kataoka’s house while the rest would stay on the steamship and wait until daybreak to land. They all went to visit the County Head (郡守), and a Japanese police seargent acted as interpreter. They asked about the situation of the island. Then part of them investigated the interior of the island while part of them investigated the coast. They departed the island at 8 p.m., and they arrived at Saigo (Oki) the next day at 4:30 p.m. They attended a welcoming party organized by officals and the people. At 10 a.m. the next morning, they left and at 3:30 p.m. arrived at Sakai, where they soon changed steamships. They arrived at the prefectural office at 7 p.m. Department Head Jinzai (神西) stayed at Oki with two staff members, Nakajima and Ohno, to investigate the island (Oki). One of the three sea lions they got at Takeshima was cooked on the ship, one was given to the Uleungdo County Head, and the last one was brought back to be used as the subject of hygiene study and is now at the hygiene laboratory at the docks. 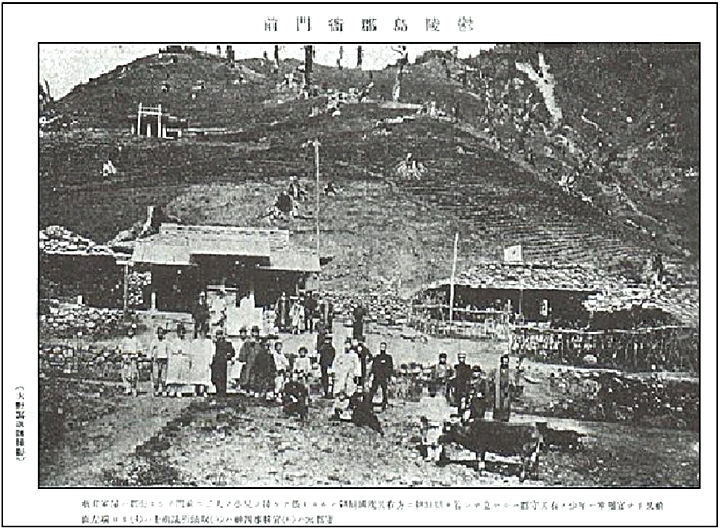 Although the main subject of the article is about the Japanese delegation visiting Ulleungdo, putting together some pieces of information of tells us about life on the island in 1906. At this time Japan already had a post office on Ulleungdo, stationed police and had numerous citizens living on Chosun’s island. It’s almost shocking how Shimane’s Prefecture’s Jinzai mentions the large number of Japanese civilians (trespassers) and even suggests the Governor “..watch over them..” Japanese officials walked at will on all areas of Korea’s Ulleungdo without needing special permission. The fact this Japanese party offered a paltry gift of cooked seal, could be interpreted as somewhat disrespectful. Certainly it’s not an appropriate gift to foreign dignitaries greeting another government official. All of the above facts suggest Korea (Ulleungdo) was under the control of Japan already by 1906, certainly not on equal footing. These reasons may be why Uldo County Governor Shim Heung Taek didn’t protest directly upon hearing the news Chosun territory had been annexed by Japan. To the left above, Uldo Governor Shim Heung Taek poses with the Japanese party on Ulleungdo. Notice he holds the Korean flag, some have said this was a quiet display of protest over Japanese involvment in the Ulleungdo region. On February 22, 1905, Shimane prefecture announced Public Notice No. 40, naming Liancourt Island Takeshima and placing it under the Chief of Oki Island. The Japanese government did not announce this decision in the official gazette, nor make a public announcement on the central government level. One can cite as a precedent of the Japanese government establishing territorial sovereignty over an island related to foreign countries, the case of the Ogasawara Islands in 1876. At that time, the Japanese government made the decision after negotiating with Britain and the United States which were deeply related with the islands, to win their understanding. Japan also notified 12 European countries and the U.S.A. of its action. 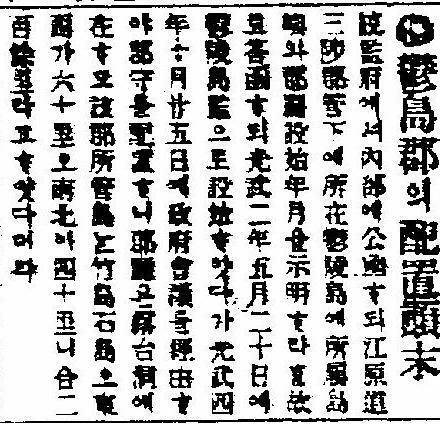 The Korean historical document below records Chosun’s opposition to Japan’s annexation of Dokdo Island at various governmental levels. The Korean government expressed their objection immediately upon being informed the Japanese had seized Dokdo. The group included official Zinzai, of Oki Island in Shimane prefecture, Director Yoshida Meigo of the Tax Supervision Bureau, police sub-station chief, Inspector Kageyama Iwahachiro, one policeman, one local assemblyman, a doctor and a technician and about a dozen ‘followers, They have come for the purpose of finding out firstly, the number of households, population, and land production, and secondly, the number of personnel and expenditure. The record having being made, we submit this report for your reference. Shim Heung Taek was not alone in his opposition to Japan’s annexation of Dokdo. Recorded in the paper above are the contentions of the Daehan Empire Governor as well. The Governor’s response is highlighted in a blue text box. The visit to Ullungdo by the Zinzai party was well known, but this data has not been examined in Japan at all. In the dispute with Korea, the Japanese government even doubted the existence of this document itself. As its basis, a Japanese scholar writes that one sea lion caught on Takeshima was presented to the County Chief, who thanked them for the gift. Such a treatment would not have happened if the County Chief had considered Takeshima as I belonging to Ullungdo. But, that is to ignore the difficult situation Ullungdo was faced with at that time. At this time, Japanese soldiers and police were permanently stationed on Ullungdo and more than 300 Japanese lived in and around Todong where the county office was located. (see pic) The fact that Zinzai and his party investigated at will the number of households, population and geographical features in the foreign territory of Ullungdo graphically illustrates the one-sided power relations of that time. If County Chief Sim did not openly raise objection to Zinzai and his party on the territorial problem, it was due to the pressure from the Japanese. His courteous treatment of the Japanese did not mean that he approved Zinzai remarks. This also does not justify the Japanese denial of this data itself. 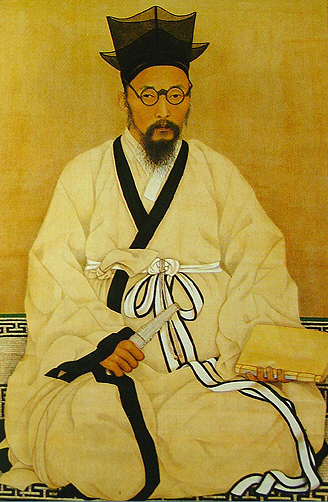 Hwang Hyeon (1855-1910) was a patriotic Korean scholar of the late Chosun Dynasty. He was recognized for his efforts towards Korean independence. His nickname was “Maecheon” and was related to scholar Hwang Eui Don. Born in Gwangyang Hwang Hyeon grew up in Gurye, South Cholla Province. Hwang Hyeon killed himself in 1910 to protest Japan’s colonization over the nation of Korea. Throughout his life Hwang Hyeon kept a diary called the Macheon Yarok. Found within its text is a reference about Japan’s illegal annexation of Dokdo Island. 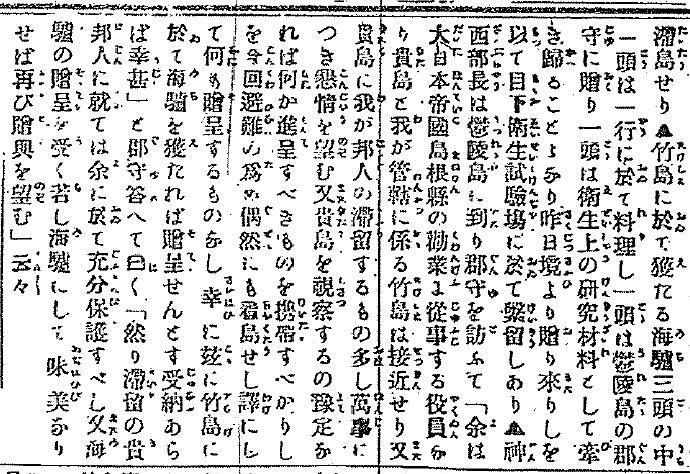 The text of his diary entry is quite similar to newspaper articles protesting Japan seizure of Dokdo. It’s not known whether Hwang Hyeon reiterated media reports or if he had heard it from other Korean citizens. 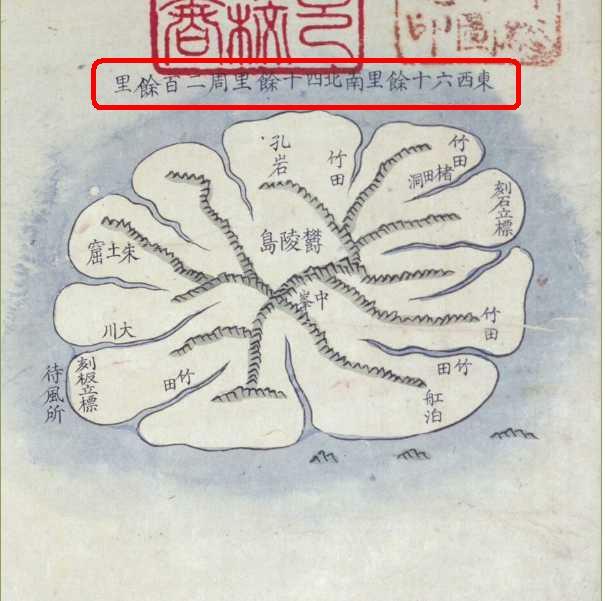 In a July 13, 1906 article in the Korean newspaper, “Hwangseong Shinmun” (皇城新聞), it was reported that the Japanese Resident-General asked the Korean Ministry of Interior to clarify what neighboring islands were part of of Ulleungdo. It also asked for the date the county office was established there. The inquiry was most likely a reaction from Korean assertions Dokdo Island was part of Uldo Country. It shows that Korea did in fact protest and Japan received these documented complaints. These days some of those who support Japan’s claim to Dokdo assert this newspaper article is proof Korea excluded Dokdo from Uldo County. Japanese lobbyists insist the dimensions given in the Korean Home Ministry’s response would have excluded Dokdo Island from Chosun territory. 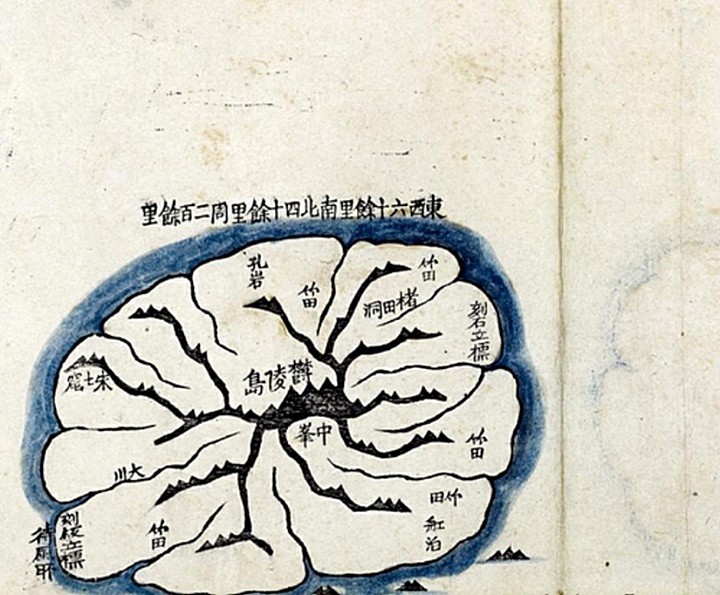 However, studying the related historical maps and records, their conclusion is incorrect. Below is the original document, an English translation and a breif analysis of this record. The Resident-General sent an official letter to the Interior Ministry asking it to clarify what islands belonged to Ulleungdo, which is under the administration of Samcheok County in Gangwon Province, and the year and month the county office was established. The response was that the post of Ulleungdo Administrator was established on May 20, 1898, and then on October 25, 1900, the government decided to post a county magistrate with the county office being at Daehadong (台霞洞). It said the islands under the authority of the said county were Jukdo (竹島) and Seokdo (石島), and that it was sixty ri from east to west and forty ri from north to south for a total of 200 ri. To understand exactly what the Korean Home Ministry of the Interior was referring to in its reply to the Resident General it’s best to determine where their data came from, especially with regard to the dimensions mentioned. A size of 60 ri East to West and 40 ri North to South with a total of 200 ri was reported. Some Japanese have asserted this was the total size of Uldo County much too small to have included Korea’s Dokdo Island. In reality, the size given was the dimensions of Ulleungdo Island was as we see below these measurements were taken from 19th Century maps of Ulleungdo. Thus, in reality, the size reported to the Japanese Resident General had nothing at all to do with the circumference of Uldo County. The above maps confirm Korea’s Home Ministry quoted the dimensions of Ulleungdo Island in their reply to the Resident General not the size of Uldo County. The size of Ulleungdo on these maps can be read as 東西 六十里 南北 四十里周二百餘里, meaning about 60ri East~West, about 40ri South~North and a total (circumference) of about 200 ri. The other piece of data we gather from Korea’s Home Ministry’s reply mentioned the islands included as part of Uldo. Ulleungdo’s appended islands were said to be Jukdo Islet and Seokdo (Dokdo) No distances were mentioned in the Home Ministry’s reply. 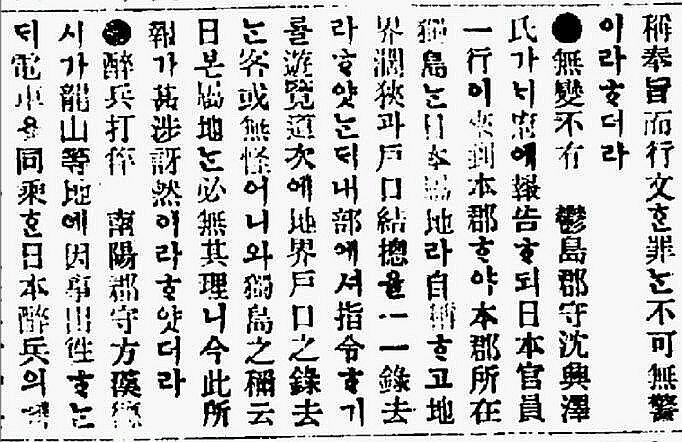 The source of information regarding Uldo Country’s islands no doubt came from Chosun’s Ordinance 41 from the year 1900. (link) Knowing the above data, it’s clear the Home Ministry’s Reply to the Japanese Resident General had nothing to do with the dimensions of Uldo County. The first half of the article merely summarized County Chief Sim’ s report, but the second half is valuable in finding out the reactions of the central government. Namely, Korea’s central government was recognizing from the beginning that Tokdo was Korean territory .Therefore, it harbors a suspicion of the movement of the Japanese officials who made incomprehensible remarks. In other words, Korea’ s central government, local Ullungdo County Chief and civilians all considered Japanese incorporation of Takeshima/Tokdo as aggression at that time. But, by that time, Japan had virtually started colonial rule over Korea, by establishing the Residency-General in Korea. 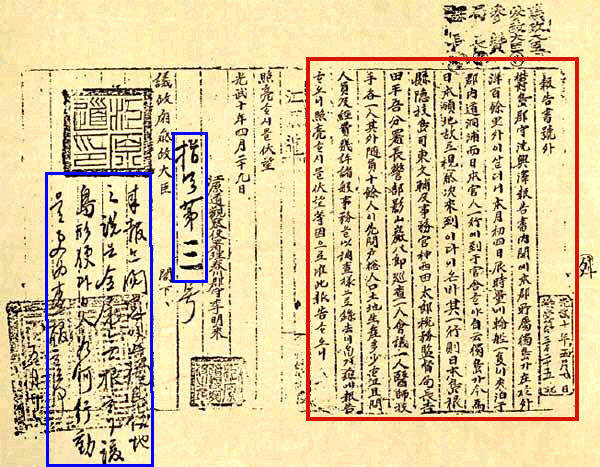 Evidence of Japan’s appropriation of Korean land prior to the annexation of Dokdo can be seen on these links (link 1), (link 2), (link 3). The documented Japanese Surveys of Dokdo undertaken by the Japanese Imperial Navy can be seen on these pages (link1), (link 2), (link3). That is why no further development could be made within the Korean government to cope with the problem of Takeshima – Dokdo. As the entire country was being robbed of its sovereignty and vanishing, the problem of the ownership of a small rocky island was hurled away. However, that the Korean people clearly raised objection to the Japanese action of incorporating Takeshima/Tokdo is a decisively important fact worthy of historical evaluation.